This year we are celebrating Lughnasa by it's older name of Brón Trogain. 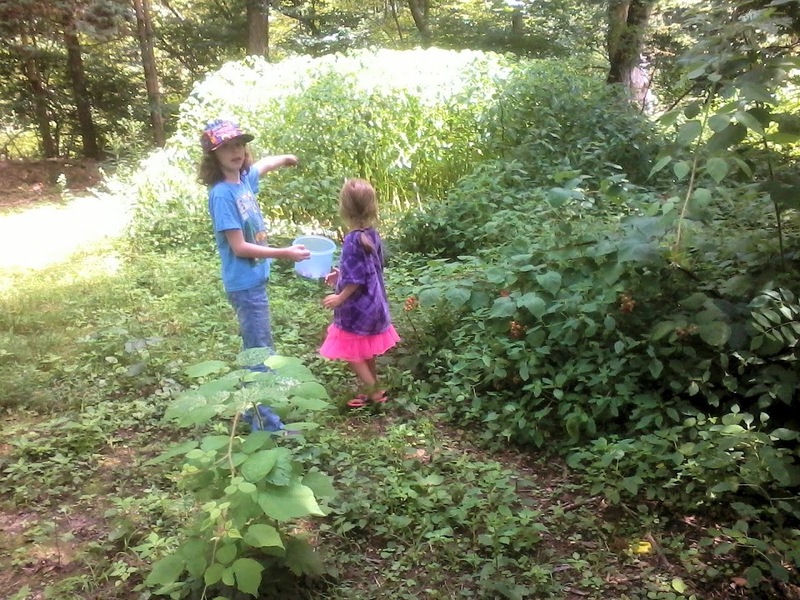 For my family it begins today, July 31st as we go out and start picking berries. 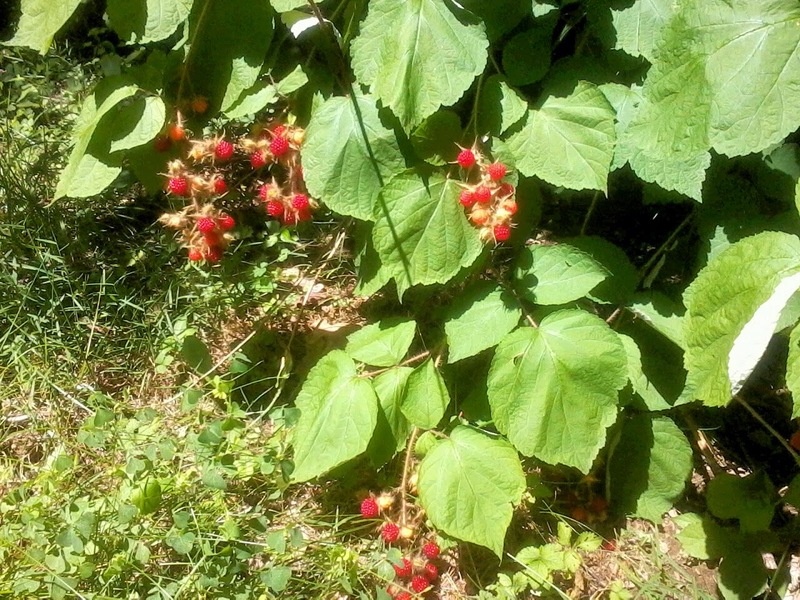 Berry picking for several years has been the main activity of our holiday, the way we officially begin celebrating. And I will reap the harvest I have sown. To the very core of the airt of the south. And I will offer to them, sharing what I have"
After we filled our bowl - with plenty left unpicked - we made offerings on our outdoor altar. My oldest daughter asked if she could have a few berries to offer to the daoine sidhe; she took a handful and went and prayed for a bit before leaving them beneath our hawthorn tree. 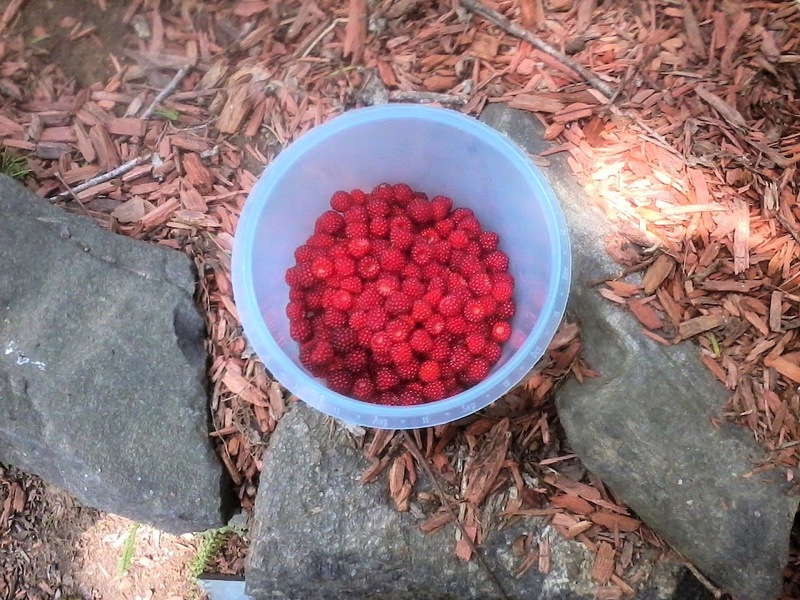 My younger children were more interested in eating the results of our efforts themselves (I believe my son may have eaten his own weight in berries). After the berry picking - and offering and eating - we had our version of athletic games, which mostly ends up being foot races, ball tossing and playing tag. The age range and needs of the children mean we have to choose things that will be more for fun than to show skill, but the intent is certainly there. We also added some prayer ribbons to our fairy tree and decorated our outdoor altar with flowers. We held a small ritual to honor Macha and Nuada, with offerings of berries and of straw and prayers for blessing and protection. We also offered ghee to the ancestors, Other Crowd, and Gods in thanks for the blessings that provide the harvest we are enjoying. Divination was done with the Ogham and the message received was quert (apple). It is clear from my last blog that for a modern practitioner there is an abundance of material to work with in finding ways to celebrate Lughnasa. I’m going to offer several suggestions for practice that could be used for anyone with a Irish leaning, or who would like to celebrate this holy day in a Irish manner, but I leave the actual ritual up to the individual or group to design. Personally I follow a basic structure of blessing the space, invoking the ancestors, daoine sidhe, and Gods and offering to them, praying or saying something about the purpose of the ritual, making a main offering for the holiday, divination, thanking the Powers, and feasting. My own approach is Irish Reconstructionist in nature and that doubtless colors my view, but I would like to offer this to anyone of any faith who celebrates Lughnasa. One aspect that should be celebrated the same whether a person is solitary or in a group is food. Ideally if you grow your own fruit or grain, or have a milk cow, you could use the product of your own harvest, otherwise you should try to find high quality, local foods to use. Most Irish cookbooks should offer recipes for Barm Brac and you can substitute fresh fruits like raspberries and blackberries for the raisins and dried peel the recipe calls for. Although corn is often mentioned in relation to Lughnasa it is likely used to mean oats, and was replaced in time by potatoes as the main produce crop. It would be fine to use new world corn, especially if gluten sensitivity is an issue, if that is a local crop that is being harvested in your area at this time, or alternately to use wheat or oats to cook with. In the same way that there are many Barm Brac recipes to choose from there are innumerable porridge recipes to which fruit can be added, and fresh milk would also be appropriate. I would suggest leaving a portion of whatever is prepared out as an offering after the celebration, either to the daoine sidhe or the gods you decide to honor, or to both. If you are practicing with a group the group should choose a suitable place outdoors to meet, preferably either on a high place like a hilltop or mountain, or by the seashore or a river, or other place considered sacred by the group. Everyone should bring a small token dish to represent their contribution to the harvest, and if possible a fire should be kindled. The group should feel relaxed and social while setting up and getting comfortable stories should be told relating to Lughnasa; if possible music should be played or people can be encouraged to sing. It would also be alright to decorate a local stone, tree, or spring with flowers or other appropriate biodegradable decorations. At this point the group can celebrate the religious rite in whatever way they prefer, with the entire festivities dedicated to the god or gods of the rite. The food should be reheated using the fire and then shared and eaten by all, with some left as an offering as previously mentioned; this can be done during the group’s religious ritual or afterwards depending on the group. More stories can be told and music played while people socialize, and then the group should have whatever athletic games they are best able to hold. My own approach is geared towards groups with small children and involves things like foot races, contests of strength, solving puzzles, or games of skill, like tossing a bean bag through a ring with the winner receiving a special token or prize. Groups without children can of course choose to athletic games more appropriate for adults. After the athletic games if the fire has died down a bit it would also be traditional for people to jump the fire. The celebration should be planned to last for the entire day and the tone should be fun and lighthearted. In contrast a solitary practitioner may have to work a bit harder to include athletic aspects, or choose not to include them at all. I would suggest if you are alone that you choose a location to celebrate that will be physically challenging to get to, and include getting to and leaving the site as part of the athletic challenges of the day. You could hike to a high place or other sacred site and then, if it’s safe build a fire do so. Sitting alone you can recite stories, poetry, or sing while preparing the area; decorating a tree or other sacred object can be done alone. You can then celebrate your solitary rite as you choose, dedicating your efforts to the deity or deities you are honoring. In the same way when you bring out and eat the food you have brought be sure to leave some as an offering. You may choose to sit for a while in silence contemplating the beauty of your location or the meaning of the holy day, or you may find ways to challenge yourself (safely) to physical activities where you are. You can even jump the fire by yourself when it is low enough. Spend as much time as you would like at your ritual site, enjoying it, and then clean up and head home. Lughnasa is also called Lughnasadh, Lunasa, Brón Trogain, Lunsadal, Laa Luanys, Calan Awst, and Gouel an Eost, and Alexei Kondratiev conjectures that the Celts of Gaul may have called this celebration Aedrinia (Kondratiev, 1998). The many names of the holiday show it's pan-Celtic character, and demonstrate that it could be found across the Celtic world. Several of the names for the holiday are references to the beginning of autumn or of the harvest. The most well known Irish name of the festival, Lughnasadh or Lughnasa, can be broken down into Lugh Nasadh and translated into either Middle or Old Irish as the assembly of Lugh or the funeral assembly of Lugh. The connection to a funeral assembly undoubtedly references the belief that the celebration was originally created by the god Lugh as a memorial for his foster mother, Tailtiu, after her death, and the assembly of Lugh is thought to refer to the many athletic games and competitions associated with the harvest fairs that occurred at this time. The other Irish name, Brón Trogain, is usually understood to mean "Earth's sorrow", with the implication of the weight of the harvest, and is seen as a metaphor for birth (MacNeill, 1962). Brón means sorrow, grief, burden, or lamentation. Trogain not only means earth and autumn but also female raven, so it could be translated as "Sorrow of the (female) raven". Additionally Trogan is associated with childbirth through this expression "used as an imprecation [curse] troigh mhna troghuin foruibh `pangs of a woman in childbirth" (eDIL, n.d.). This name for the holiday is mentioned in the Wooing of Emer: "55. To Brón Trogaill, i.e. Lammas-day, viz., the beginning of autumn; for it is then the earth is afflicted, viz., the earth under fruit. Trogam is a name for 'earth.'" (Wooing of Emer, n.d.). MacNeill suggests, based on passages from the Acallamh na Senórach, that Brón Trogain was the older name for the holiday which only later came to be known as Lughnasa. Of the four fire festivals of the pagan Irish Lughnasa has some of the least mythical associations. It appears only once in the Lebor Gabala Erenn, as the date that the Fir Bolg invaded Ireland (MacNeill, 1962). It's celebration is mentioned in at least two other places: the Wooing of Emer and the Birth of Aedh Slaine. The Wooing of Emer passage has already been quoted above and refers to the holiday as the beginning of autumn and a time of fruit. The second reference says: "For these were the two principal gatherings that they had: Tara's Feast at every samhain (that being the heathens' Easter); and at each lughnasa, or' Lammas-tide,' the Convention of Taillte." (Jones, n.d.). This places Lughnasa on a level of equal importance with Samhain and describes it as a time of community gathering. In modern practice Lughnasa is celebrated on August 1st, however there is evidence that the date of Lughnasa would actually have represented the starting date of a series of festivals and fairs, rather than a single one day celebration with harvest fairs associated with Lughnasadh, called Oenacha which themselves may last for several days, appearing as late as August 12th (MacNeill, 1962). In modern Irish the word Lunasa means both the first of August and is the name for the entire month of August. There are some hints that the dates may be hard to pin down because they were originally based on a lunar reckoning that is now lost (MacNeill, 1962). It is generally agreed though that no harvesting should be done before the correct date, represented by Lughnasa, and that to harvest before Lughnasa is both bad luck and the sign of a bad farmer or poor housewife (Danaher, 1972). This folk belief persisted even into the 20th century and indicates the strong connection between Lughnasa and the harvest. There are several themes surrounding this celebration that include the mundane, the spiritual, and the blending of both. Lughnasa celebrates, at its core, the beginning of the harvest and the new abundance of food being gathered; because of this it is strongly associated with the cooking of specific foods that represented the harvest, especially porridge and bread, often with fresh seasonal fruit being incorporated (Danaher, 1972). There is also mention of cows being milked in the morning and the milk used in the feast, as well as a special type of bread being made from harvested grain and cooked with rowan or another sacred wood before being handed out by the head of the household to the family who eats it and then walks sun-wise around the cooking fire, chanting a blessing prayer (McNeill, 1959). It was understood that the period just prior to the beginning of the harvest was the leanest of the year, making the celebration of fresh fruit, vegetables, and grains all the more special to the people (MacNeill, 1962). This may also be symbolically related to another legend of Lughnasa, the battle between the god Lugh and the mysterious mythic figure of Crom Dubh. Crom Dubh means the “black bent one” and he had a special day on the last Sunday of July called Domhnach Crom Dubh and a dangerous bull bent on destruction that had to be stopped to preserve the harvest (Kondratiev, 1998). Many of the myths relating to Lugh and Crom Dubh, who is sometimes called Crom Cruach, involve Lugh battling and outwitting Crom and thus insuring the safety and bounty of the harvest; in some cases this theme is given the additional layer of the defeat, sacrifice, consumption, and then resurrection of Crom’s bull which may argue for an older element of bull sacrifice on this day (MacNeill, 1962). The Carmina Gadelica records several specific actions and charms to be done during the first harvest which expand on the importance of this turning point of the year. Another common practice at Lughnasa was for people to gather together outdoors at a traditional place, often with the entire community getting together, and the site chosen would not only be someplace beautiful and wild but remote enough that travelling to it would represent something of a challenge (Danaher, 1972). Other practices of Lughnasa include decorating holy wells and pillar stones on this date, and also of travelling to hill or mountaintops; all of these varied by location and indicate that while the festival itself was widespread the nature of the celebration was dependent on the area and took on a unique local flavor (MacNeill, 1962). There are references to blessing cattle on the eve of Lughnasa and of making blessing charms for the cattle and milking equipment that the blessing would remain for the year to come (McNeill, 1959). Divination was practiced, with a particular focus on the weather during the harvest and this seems to have been based on observations of the weather so far during the year and on atmospheric conditions on Lughnasa, with color and appearance of certain landmarks indicating either fair or foul weather to come (Danaher, 1972). Lughnasa was also the time in Ireland, Scotland, and the Orkneys for handfastings and weddings, or the dissolution of unions formed in the previous year (McNeill, 1959). Trial marriages of this type were used to see if the new couple was compatible; should they choose to separate after a year there was no shame in it and any child that was produced from the union would be ranked with the father’s legal heirs (McNeill, 1959). Finally Lughnasa was also well known for harvest fairs and an assortment of athletic competitions and horse races; it is important to note that the ancient fairs, or oenacha, were not occasions of commerce but of social gathering and celebration (MacNeill, 1962). Many different types of games were held, as well as competitions of agility and strength, fire leaping, and swimming races of both men and horses (Danaher, 1972). A general party atmosphere prevailed with dancing and music, storytelling, feasting, and bonfires (Evert-Hopman, 2008) Overall it can be gathered from a wide understanding of the various Lughnasa customs that this celebration was one based on the gathering together of the community to celebrate the fresh abundance of a new harvest with joy and enjoyment. People gathered to reinforce and celebrate the bonds of community through marriages and social mixing, and to strengthen and honor the bonds between the people and the spirits of the land and the gods through decorating wells and standing stones, the re-telling or re-enactment of mythological tales, acts of blessing, and ritual. It is unknown now exactly what pagan religious ceremonies may have been held on Lughnasa but there are several deities that we do know are associated with this holy day. The most obvious deity associated with Lughnasa is of course Lugh, who battles with Crom Dubh and is also said to have instituted the games to commemorate his foster mother. Tailtiu herself could be another deity associated with Lughnasa, as could the goddess Aine who in some mythology is connected to both a three day period during Lughnasa and to the mythic figure of Crom Dubh as his consort during this time (MacNeill, 1962). Another goddess associated with Lughnasa is Macha, one of the Morrignae, who some believe raced the king’s horses on Lughnasa; whether or not this is so there is evidence of a long standing celebration of Lughnasa at Emain Macha and the surrounding areas in Ulster (MacNeill, 1962). The harvest itself may also be connected to the Cailleach, as it was a common custom to associate the last sheaf in the field with the Cailleach; however this may be more appropriate later in the harvest season at Samhain (Danaher, 1972). Lughnasa has a rich history. Although in modern paganism Lughnasa is often not given great significance in Irish paganism this holiday was very important indeed and was celebrated with weeks of fairs and festival games and with special foods. It was a time of community togetherness, marriages, and reciprocity with the Gods and spirits. Studying the folk practices can give us both a greater understanding of how this holiday has been celebrated throughout the years but also give us material to work with in reconstructing modern practices. Danaher, K., (1972). The Year in Ireland; Irish calendar customs. Minneapolis: Mercier Press. Kondratiev, A. (1998). Apple Branch: a path to Celtic Ritual. New york: Citadel Press. MacNeill, M. (1962). the Festival of Lughnasa. Dublin: Oxford University Press. McNeill, F. M. (1959). the Silver Bough, volume 2: a calendar of Scottish national festivals, Candlemas to Harvest Home. Glasgow: Maclellan. Most Gods have a variety of different epithets attached to them and some have several different names that they are known by but none may have as many as Wodan who many know as Odin*. If we look at all the different mythology and lore we find that Odin has more than 200 different names that he uses in different contexts or is known by in different places. Each of these names can be useful in helping us better understand who this enigmatic God is and I have also found it very useful to call on specific names of Odin when I need to honor or pray to different aspects of his energy. As much as I normally loath wikipedia as a reference there is a fairly good list of Odin's names there. It's beyond the scope of this article to list all of them, but I'd like to touch on a couple at least, and why I personally choose to use them. I have several specific ones that I call on regularly, for example, but I want to be very clear that these are all names for a single god - Odin - not different Gods. The best analogy for this might be to compare it to the use of nicknames. I honor Odin as one being but I choose different heiti (bynames or nicknames) for him in different contexts. In the Gylfaginning and Grímnismál Odin appears as Harbard, meaning Grey beard. In this guise he is a ferryman who challenges Thor by refusing to ferry him across a river and insulting him. When I am feeling challenged by Odin this is the name I use for him. This is also the name I call on and pray to in challenging times or when I am trying to maintain my self control when being confronted by difficult people. In Óðins nöfn we are told that Odin is also known as Jölföðr, meaning Yule father. My family honors Odin by this name every Yule and we see him as the one who brings gifts to the children. I'm not saying Odin is Santa Claus but I will say that I see the Yule Father as one of Odin's most benevolent and kind forms, where he reinforces reciprocity by encouraging the giving of gifts and the celebration of joy and fellowship in the darkest time of the year. Oski, God of Wishes and things wished, is a name for Odin in the Gylfaginning and Grímnismál. I pray to him sometimes for inspiration and often for luck. He always expects a gift for a gift, in my experience, but he is generous with his giving. I have prayed and offered to Oski several times in dire financial circumstances and always had a positive outcome, although never quite in an expected form. In Baldr's Draumar Odin goes by the name Vegtam meaning Wanderer or Way-tamer. I call on him especially for seidhr work because I see him as Odin who travels the 9 worlds and journeys to the realm of the dead. As a seidhkona this resonates with me and I find this name for Odin works really well for me when I am doing those same things myself. There are a few other names I also use regularly for Odin. One from the Gylfaginning is Hrafnagud, meaning Raven God. I tend to use this one when doing divination or receiving omens more generally and almost always when I see ravens or crows I feel are associated with Odin. Another which is found in both the Gylfaginning and the Skaldaparmal is Vidrir, meaning Stormer; I tend to associate this one with Odin of the Wild Hunt. I use this name when storms pass by, when I feel the Wild Hunt near, or when I am calling on Odin in the context of the Leader of the Hunt. I use the name Hroptatyr, or Sage, from the Gylfaginning when I am honoring Odin as a wise teacher or offering to him in the context of learning. I use this one often in relation to the runes. Finally for healing work I pray to him as Veratyr, God of Men, a name from both the gylfaginning and Odins Nofn. This is of course only a small sample of his many names. Some other popular ones that you will often see include Har (High One), Grimnir (Hooded One), and Valfodr (Father of the Slain). Many of his names, like Bolverk (Evil Doer), relate to specific stories and it is a good idea to read those stories and understand the context of the story to understand the real meaning of the name. If you are drawn to honor Odin I highly recommend learning something about at least a few of his many names in order to better understand him. "Fergus dixit ’ ‘Fó fer fris tibther manip sceó mera mórgnímo merthar airbiur mo chlaidib mache mind mosdísem calga de Galión gáir..."
"Fergus said: ‘By the point of my sword, halidom of Macha, swiftly shall we wreak vengeance on swords following on a cry (for help)..."
I have long known that I needed to find a bronze sword for ritual use, but I never felt a huge need to get it done, just a general sense that eventually it would be needed. Late last year that sense started to become more urgent, and I realized why after finding out that I had to have a sword for a ritual I had volunteered to participate in at a retreat. I cannot work with iron so finding a bronze blade became a top priority...and so this is the story of Macha's sword and how I came into possession of it. I knew that the only realistic option would be to commission the sword and several people recommended that I check out Neil Burridge's site *. His selection is good and the quality was vouched for by multiple people so I decided to email him. Because he offers replicas of blades found in Britain and I was looking for an Irish blade I requested the closest sword in style to what I wanted. 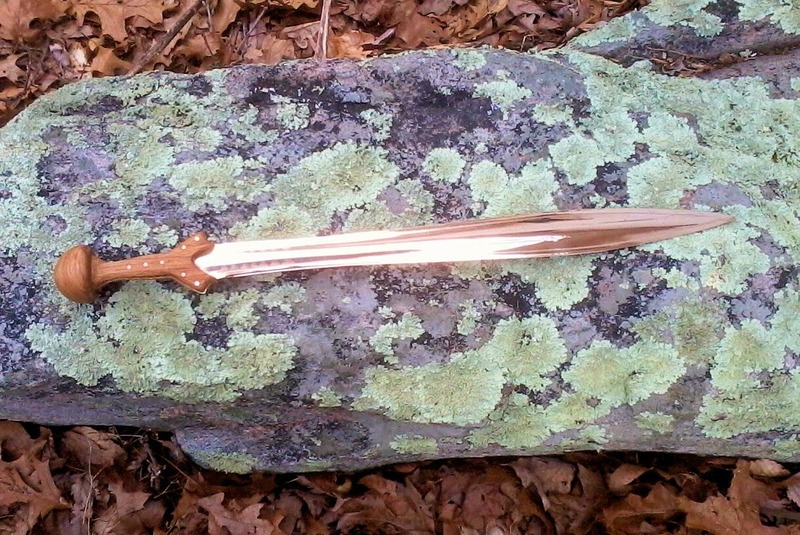 I was pleasantly surprised when the sword maker contacted me and opened a dialogue offering an opportunity for me to explain exactly what I was looking for, and even more pleasantly surprised when he offered another option, a slight variation on one of his stock swords. This blade was very similar, he said, to an archaeological find from the Nooan area of Inchiquin in Ireland and he provided a link with some information. The find was associated with Lake Inchiquin, itself a place rich in fairy lore, and I was pretty quickly won over to the idea. This all occurred around Imbolc this year and I knew I needed to get the blade within a few months; however I was forewarned that the actual forging might take some time. Things proceeded faster than expected though and I was contacted again on the 14th of that same month and told that the blade had been cast. That day Cornwall, where the sword was being made, was experiencing severe storms similar to what we in the United States would call a hurricane and it was in the midst of this storm and its immediate aftermath that the sword was made. It seemed entirely appropriate that this sword, intended to be dedicated to Macha, was born in a storm with all that energy around it. It also came about that the sword was blessed at a holy well in Cornwall**, the Madron Well. Triple blessed, actually, being taken to a clootie tree at the site as well as laid on the stones of the well itself and dipped in the waters. I felt extremely lucky and honored that this was able to be done for the blade, but somehow also not surprised; at this point it was clear that the sword wasn't an ordinary commissioned piece. It had a spirit of its own already and a sacredness to it. 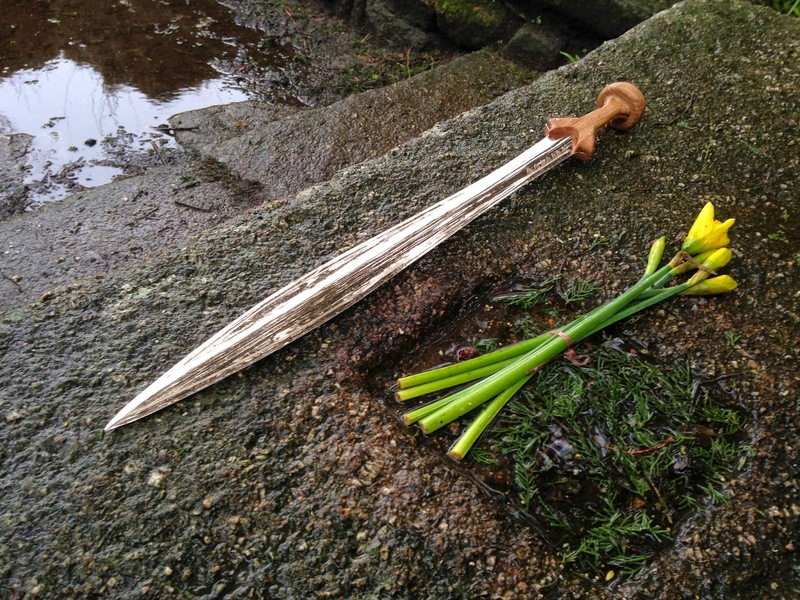 The blade was blessed here and dedicated to Macha on the equinox. It traveled with me to the Morrigan Retreat this past June and played its part in a ritual for Her - and truly has proved to be a sacred thing of Hers. 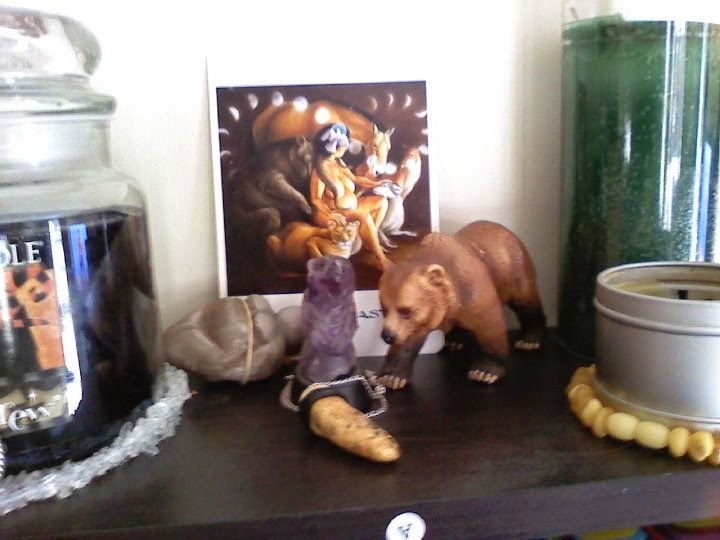 It rests near Her statue and devotional items on my altar now, until it is needed again. My next project is to make a scabbard for it, with appropriate bronze age style decorations. * I can't recommend Neil highly enough. His work is amazing and more than worth the cost. ** this is another story, but not properly mine to tell. I will say that the sword seems to have a bit of its own agency...even before I got it. If there's one thing that seems to be a constant in neopaganism and polytheism it is the rush by newcomers to the concept of multiple deities to find "their Gods". I have seen endless iterations of this over the years, of people who have converted from another faith who then immediately feel the need to declare who their Gods are. Immediately. In a way I understand why this happens - it must be unnerving if a person is going from one spirituality to another and suddenly feels adrift. For people coming from atheism or agnosticism I can see how the switch from un-belief or questioning to belief might bring with it a need for certainty about the Gods themselves. And lets not forget that ever present desire to fit in with a new peer group of people who are often vocal to varying degrees about who they worship. Don't get me wrong either, as a polytheist it is important to know who (and why, and when, and so on) you are honoring, and it is certainly a normal part of the process to try to figure out who you, as an individual, should be worshiping especially in our culture where people are not being raised with the Old Gods (or they wouldn't need to convert to begin with). The problem comes in, in my opinion, with the speed at which people feel they need to do this. I cannot tell you how many times I have seen newcomers to Celtic or Norse/Germanic paganism who have been pagan for a matter of days boldly declaring that their God or Gods or pantheon is what-have-you. And then a few days or weeks later they either boldly declare a new set of Gods as theirs or, just as often, disappear from the online community they just joined and show up in another one (what can I say - I get around) declaring with equal fervor their dedication to a wholly different set of Gods. There is, naturally, nothing wrong with starting in one place and ending up in another or feeling pulled by a different God or Gods than the ones you began with, however pantheon-hopping repeatedly as a new pagan - repeatedly and loudly - is not going to get you much respect from more established community members or help you feel more stable in your own faith. So I have a couple suggestions for new pagans just starting out who aren't sure who their Gods are or how to go about finding where they belong. Loud proclamations are not your friend - There is no need to declare your pagan allegiance to any particular pantheon or deity as soon as you decide paganism is the spiritual path for you. You do not get bonus pagan points for announcing that you worship Goddess such-and-such or are on a specific path, especially if you aren't sure who that deity is or what that path is. In fact the quickest way to lose respect in any group is to burst in as a beginner and make a big claim while simultaneously showing that you don't know what you are talking about. Even more so if it involves spelling the name of your deity or religious path incorrectly. It is perfectly fine to be a seeker and admit you aren't sure yet what direction you are going in. Ask lots of questions - Questions are your friend. People in groups may not agree with each other on lots of details, but they do, in me experience, like to help new people out whenever they can. Ask questions and you can learn an enormous amount about what other people do and believe and this will help you figure out where you are going. Even disagreeing with other people is helpful in letting us find out what works for us. Read as much as you can - Or if reading isn't your thing find good info in other media, but the point here is be open and study different options. Feel like Irish might be your thing? Read the myths and stories. Think Norse is the way you're leaning? Grab a copy of the Eddas and get a feel for the deities. Have no idea at all where to start? Find a good general world mythology book and read a selection of stories. Many people start with their own ancestral cultures or homeland, but sometimes you might find that nothing seems to be clicking, so keep an open mind and read the mythology. The myths are how we get to know the Gods, the first step in understanding who they are. Experiment - If you feel drawn to a God, Gods or pantheon then start by dipping your toe in the water so to speak. Read as much as you can and find ways that you are comfortable reaching out to form a connection to those Gods. Make offerings, use guided meditations, honor them in an appropriate context at a holiday - whatever works for you on the religious path you're on. But the point is don't rush into declaring a commitment to any deity, rather let yourself get to know them first, and let them get to know you. Sometimes we like a God very much on paper, but find that in practice they don't gel well with us at all, or don't respond, or just don't feel right. Be active in other ways - While you are sorting out which Gods you will worship you can be actively honoring your ancestors and the spirits of the land. You can be finding out which spiritual path works best for you. Whatever Gods you decide on (or who decide on you) your ancestors and land spirits will be the same and are important too - so use the time to focus on those aspects. Most importantly take your time - There is no rush. There is no pressure. You are not more pagan if you are committed to a pantheon or dedicated to a deity, and you aren't less pagan if you are still searching for your place. Don't feel like you have to instantly choose and lock yourself into a specific thing. While it can be frustrating to be a seeker it is also a wonderful opportunity to explore all of your options. Enjoy the experience for what it is rather than rushing to get to the destination. Let the Gods come to you - or find your way to them - slowly over time. Being a polytheist is about having a relationship with the Gods you honor, built on reciprocity, respect, and a sense of connection, and that doesn't happen - usually - overnight. It's a process. the blind man must be led." Isa is a rune than represents all aspects of ice. It is the need for caution, hidden dangers, and passive treachery, a rune that warns to beware who and what you trust. Isa also represents being motionless, stillness, calmness, rest, retreat, inertia, and temporary stasis. As well it can be temporary opportunity and taking advantage of transitory situations to our own advantage. In a broader sense Isa is also representative of winter and many people associate this rune with Skadi. Isa can be seen as reflecting the primal ice of Niflheim and in some senses of being a part of the original process of the creation of the worlds. In divination Isa can represent a need for reflection or consideration before acting, or a need for a time out to consider options. It can also indicate an enforced period of stillness or stasis, when goals or plans will not move forward. In some cases Isa is a time marker, literally meaning winter. In a more negative sense it can indicate not trusting the obvious and proceeding with caution. Magically Isa can be used to slow things down or cool things off, especially emotions. I have had a lot of success with Isa by galdring it or visualizing it over an area or situation where a fight was in the process of breaking out or people were getting extremely upset; Isa's energy chills the situation out and diffuses the emotional tension. It can also be used, with caution, for healing work, although you should always be careful to set it for a specific period of time and remove it afterwards. Connecting to Isa is easiest, in my experience, in the winter because that's when we can most clearly feel it's presence. However a guided meditation or basic journey to the rune will work at any time. If you use Isa magically in any way or undertake any meditations be sure to journal your experiences; it can also be helpful to simply reflect on your feelings relating to ice and winter in general.